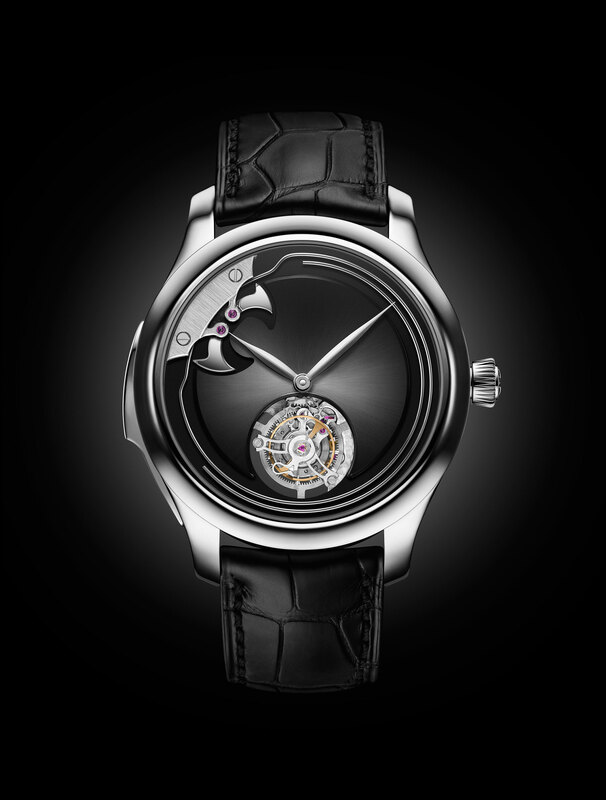 At the SIHH 2019 H.Moser & Cie released the Concept Black Minute Repeater in a Swiss Alp case. Now, at Baselworld 2019, the minute repeater and tourbillon combination is revisited in a different physical form – the new Endeavour Concept Minute Repeater Tourbillon. This new watch, unlike the earlier piece, does have hands, as well as the minute repeater and skeletonised one-minute flying tourbillon, with the same glossy black lacquered dial. Additionally, unlike the Swiss Alp Concept model, the hammers and chimes of the Endeavour Concept Minute Repeater Tourbillon are visible on the dial side. As was the case for the Swiss Alp Concept Black Minute Repeater, the movement for this new watch, the manual-wind Calibre HMC 903, was created in conjunction with MHC Manufactures Hautes Complications SA. Of particular note, the chimes had to be curved so as not to interfere with the flying tourbillon. It beats at 21,600VPH has a power reserve of ninety hours. The movement and components are hand-finished and decorated, and there double Moser stripes on the plate and bridges. The minute repeater chimes the hour, quarter hour, and minute. The sliding bolt, fitted on a Teflon runner, is built into the main plate. The case middle has been widened in order to fit the movement whilst allowing enough space to create the chamber for the sound. Available in a limited edition of ten pieces, the the 18 carat white gold case measures 43mm with a thickness of 14mm. It comes on a black alligator strap with red lining and a matching 18 carat white gold buckle.